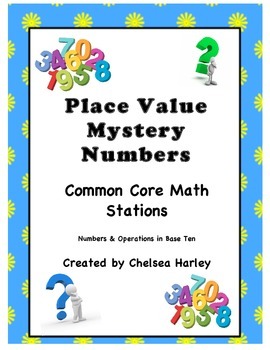 These Mystery Numbers help students review the positions of different place values. 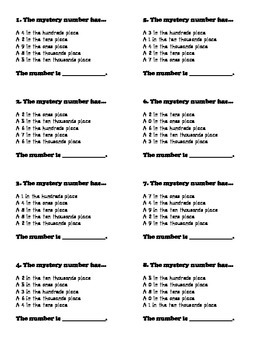 Mystery Numbers tell the student what digit should go into what place value position. 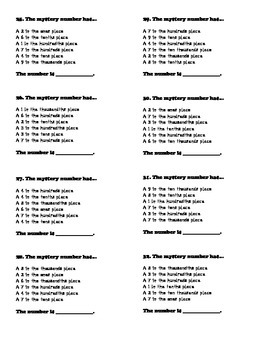 The place values are mixed up and students must use their knowledge of place value to correctly order the digits. This product has 4 sets of 8 Mystery Numbers. 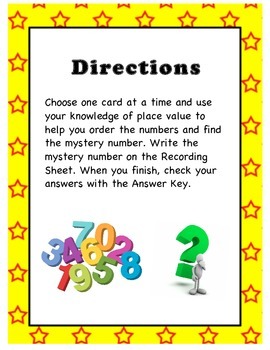 Each set gets more difficult as it adds more place values to the mix (including decimals). The first set is whole numbers through ten thousands. The second set is whole numbers through hundred thousands. The third set is decimals through hundredths. The fourth set is decimals through thousandths.